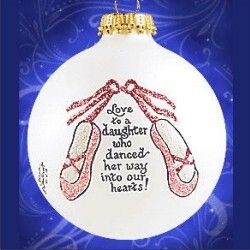 The darling young dancer in your home will be thrilled by the daughter dances glass personalized Christmas ornament from artist Teresa Thibault, and it significance will only grow through the years! Handcrafted from a genuine hand blown glass globe and accented with sparkling glitter, the ornament already has the text you see imprinted on the front. There's space on the opposite side where we'll hand paint your lasting message of love and encouragement. This dancer glass personalized Christmas ornament for daughters is one of several ballet ornaments personalized for the graceful young gal in your life. Along with custom personalization, we include an attractive cord for hanging this ornament anywhere it looks its best.